NORWALK—Every time the Stratford High wrestling team hits the mats, it gets a little bit better. It might be during a practice or it might be during a tri-meet against two teams from another league. 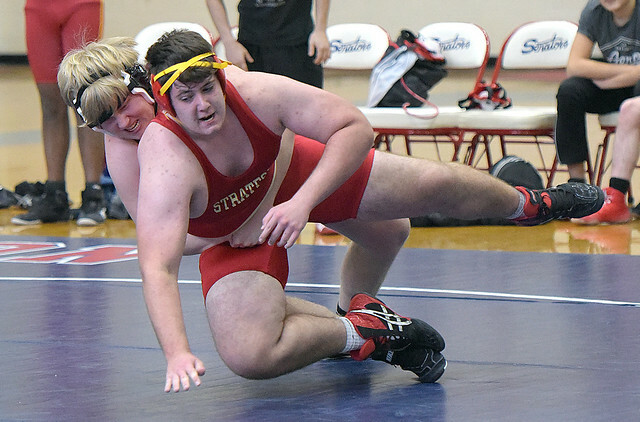 The Red Devils split a pair of matches on Saturday­­­­­­­­, topping St. Joseph 30-21 after falling to host Brien McMahon by a 54-18 score at the Kehoe-King Gymnasium. The day got off to a big start for the Red Devils as Sean Meisel (120 pounds) and Tanner Mitchell (126) posted back-to-back win, via pin. It took Meisel just 46 seconds to get his six points while Mitchell won in 1:40 to give the Red Devils a 12-0 lead. A pin at 145 pounds by Sam Schumann gave Stratford an 18-12 lead on the Senators, who ran the table from there. “We always get killed on forfeits,” said German, who was missing a handful of wrestlers due to injury and other obligations. Meisel was one of a few wrestlers who went 2-0 on the day, but actually pinned both of his opponents. Against St. Joe’s, Meisel only needed 43 seconds to be victorious. Meisel, a junior, is proof of what can become of a career if a wrestler stays with it and works hard, according to his coach. Mitchell also went 2-0 on the day, earning a forfeit win against St. Joe’s. Other winners against the Cadets were: Josh Kydes (132) by forfeit, Hayden Roberts (138) by forfeit, and Drilon Nasufi (160) by forfeit. Brady Havee wrestled his heart out in the heavyweight match, falling in overtime. Meisel said he has seen his team get better over the course of the season and expects more of the same moving forward. The Red Devils will be back in action on Wednesday with an SWC match at Brookfield. The match starts at 6 p.m.